The fashion world is consumed by one key word lately: leather. Some of the biggest names of this $9.7 billion industry are actively implementing traditional biker styles in their new lines. From Junya Watanabe's classic zippered biker jackets to Jean Paul Gaultier's tough biker-informed runway or Karl Lagerfeld's newly morphed biker style outfits, the biggest designers are responding to an aesthetic that seems to have gained more popularity from the time when J. Dean and M. Brando would express their lack of desire to conform by way of leather. 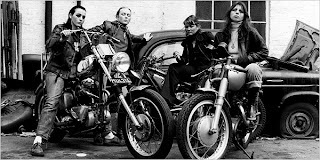 The biker community has undergone a major shift and many women are to be found in biking entourages around the country. And with their Harley Davidsons come other accessories as well. As the fashionistas have it, even the best and most complete of outfits needs to be accessorized and biker looks are no exceptions. Accessories are not a frivolity and the right kinds can truly enhance the full biker presentation. Ducati or Buell would have been stuff that ran on oil or could be scrubbed down with Armor All. Now most manufacturers have their own clothing lines. just used the following phrase, 'how very biker chick' just the other day. This is not just a discussion of fashion choices but rather a significant mentioning of gender role shifting. Do you know where I could find the jpeg as a poster? You could save this as a jpeg and have it enlarged over at Costco. They develop good quality photos there. I hope this helps.